The spiritual and celebratory designs of Sage Jewels, LLC consist of quality materials that include gemstones, handmade dichroic glass, natural stones, pearls, Swarovski crystals and crystal pearl, glass beads, seed beads and sterling silver. As a jewelry designer, Lisa promises that "you won't see your Sage Jewels creation being worn by others." A global voice of the human village. Although her presence is gone she left us with so many words of wisdom. 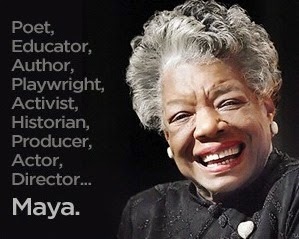 Thank you for sharing your gift with the world Maya! So as you rise to the heavens to watch over us, I am reminded of your famous poem 'Still I Rise" and yes in death still you RISE!! Kazuri offers unique programs for non-profit organizations to utilize Kazuri beads to raise funds. The beauty of the hand crafted beads, the story of Kazuri and the popularity of the beads make this a profitable and rewarding opportunity for any organization. Sage Jewels welcomes the opportunity to work with non-profit organizations in the development of a unique jewelry design for your fundraising efforts. For those with an astute taste for jewelry - Custom Hand beaded Jewelry Designs (www.sagejewels.net) As a jewelry designer, Lisa promises that "you won't see your Sage Jewels creation being worn by others." Sage Jewels 2013. Awesome Inc. theme. Powered by Blogger.